Where are you right now in the pursuit of your goals for this year? Where have you knocked it out of the park? Where has your progress lagged your expectations? What are your top priorities for the coming year? In The Power of Focus, authored by Canfield, Hansen and Hewitt, the point is made that “the main reason that most people struggle professionally and personally is a lack of focus.” The book provides practical and easy to implement strategies to support you in creating and reaching your targets in all aspects of your life. No matter what stage of life you are in, being deliberate, persistent and focused will serve you in creating your future. Here are a few key tips from the book that will help you lay a foundation for harnessing your focus and get you ready for the coming year. Habits are nothing more than behaviors that we engage in over and over again until we do them without thinking about them. Early on in life, most of us learned how to ride a bicycle. Remember how much there was to think about? We had to pedal, steer, watch out for traffic, keep our balance, use hand signals for a turn…so much to keep in mind. Yet, as we practiced those behaviors repeatedly, riding a bike became easier and easier to do until that day when we just got on the bike and pedaled away without a second thought. We all have good habits and some not so good habits. Take stock of your behaviors that support you, such as getting 7 – 8 hours of sleep each night, eating healthy foods, or spending time with your family. Acknowledge yourself for your good habits and keep them going. Then, take stock of your not so good habits that are getting in your way, such as being late to meetings, doing your email while a colleague or associate is talking with you, or not exercising regularly. Prioritize which one you’d like to work on first and define the new habit that will replace it. Finally, take consistent action each day to install that new habit. Research indicates that it takes, on average, 66 days to form a new habit. The amount of time it takes for you is dependent on the habit’s complexity. Be patient and persistent and keep track of your progress. Before you know it, you’ll be ready to work on the next successful habit you’d like to take on. One of my teachers once shared a philosophy she had learned in her career and it has guided many of my own decisions. That philosophy is “if it’s not my genius, it’s not my job.” Too often, whether we work in a company or are running our own businesses, we get caught up in the day-to-day operations and administration and spend more time putting out fires, answering email, handling bookkeeping, and managing employee problems than doing what we most love. Focus the majority of your time each week doing the things that you do best and let others do what they do best. When you are using your strengths, you are far more likely to be engaged and energized. This puts you in the mindset that will allow you to do your best work. Before you say, I can’t afford to hire someone. Think again. If you’re inside a company, you likely already have people who would be happy to take on some of the tasks that are draining your energy. If you own your own business, imagine how much your business could grow if you took back those hours that you’re spending doing things you don’t enjoy. That will more than pay for the bookkeeper, marketing consultant, or personal assistant who you hire full or part-time. Remember, this is all about focus. If you are scattered in too many different directions, it’s impossible to get traction on your most important result. Finally, to set a strong foundation for harnessing the power of focus, you must create your master plan. What is your vision for the future you want to create in the next year? Really give yourself some time and quiet space to play with this. Make this vision as all encompassing as possible and state each aspect of it as though it’s already happening, such as, “I am taking a month of vacation each year,” or “I am working with a collaborative team.” Include every aspect of your life, not just your work. This might include, your financial life, health and wellness, fun, relationships, personal development, contribution/volunteering, and anything else that is important to you. Then, consider what milestones you will meet 6 months from now, then 3 months from now, 1 month from now, next week, and tomorrow to bring that vision to reality. Create goals that are specific, measurable, achievable, reasonable and time-based. I know we’ve all heard about SMART goals. Be honest though. How often have we all set goals that are a bit on the vague side? Once you have that list of goals, ensure that you are taking one step toward your broader vision every day. Creating a habit (see tip #1) that ensures you are focused on chipping away at your goals each day will keep you inspired and moving in the direction of your desired destination. As this year draws to a close, I invite you to pause and take the steps that will determine your success in the new year. 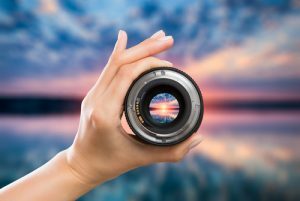 If you’d like to dive more deeply into what focus can do for you, click the link for more information on The Power of Focus. Best wishes for a focused year.